Seashore Engineering were engaged by the Western Suburbs Regional Organisation of Councils (WESROC) to assess vulnerability and prepare a foreshore management plan for 16.1km of estuarine foreshore. 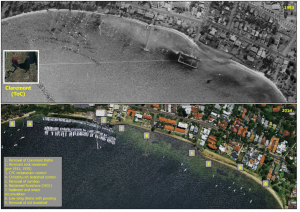 The plan was prepared for the Swan River foreshore managed by the Towns of Claremont and Mosman Park, the Shire of Peppermint Grove and the Cities of Nedlands and Subiaco. The councils were experiencing problems with river wall collapse and erosion of foreshore areas, causing damage to infrastructure and vegetation. Seashore determined estuarine hazards and used them to develop a 50-year foreshore management and adaptation plan at an asset level within a broader foreshore segment level. Than plan provided information to focus funding for future foreshore structure maintenance and stabilisation works, reducing the reliance upon reactive foreshore management. Costed capital and maintenance works, as well as monitoring and adaptation triggers, were identified for three time frames to ensure long-term plans can be achieved.